Ben Franklin quoted “An Ounce of Prevention is better than cure.” In the world of teeth, this concept relates to the prevention of dental caries in children and adolescents. Preventive measures, when followed and utilized properly, will definitely show a significant reduction in dental caries. Dental caries is a microbial disease caused by an ecological shift in the composition and activity of the bacterial biofilm when exposed over time to fermentable carbohydrates, leading to a break in the balance between demineralization and remineralization. Dental surfaces with deep pits and fissures are particularly more prone to caries  and, in general, caries on occlusal and buccal/lingual surfaces account for almost 90% of caries experienced in children and adolescents. Based on a systematic review, a 2016 guideline panel convened by the American Dental Association Council on Scientific Affairs and the American Academy of Pediatric Dentistry came to the following evidence-based clinical recommendations for the use of pit-and-fissure sealants on the occlusal surfaces of primary and permanent molars in children and adolescents. Sealants are effective in preventing and arresting pit-and-fissure occlusal caries lesions of primary and permanent molars in children and adolescents compared to the nonuse of sealants or use of fluoride varnishes and can also minimize the progression of noncavitated occlusal caries lesions (also referred to as initial lesions) of the tooth. Hence, sealants are the most effective clinical procedure to prevent pit-and-fissure caries. Simonsen has described pit-and-fissure sealant as a material that is introduced into the occlusal pits and fissures of caries-susceptible teeth, thus forming a micromechanically bonded, protective layer cutting the access of caries-producing bacteria from their source of nutrients. The effectiveness of resin-based sealants depends primarily on retention and secondarily on cariostatic effect of the sealant. The failure of sealant resin-based retention is mainly attributed to the moisture contamination. To overcome this drawback, UltraSeal XT ® Hydro, a breakthrough sealant that is moisture friendly but not susceptible to water absorption and degradation like other hydrophilic sealants, has been introduced. UltraSeal XT ® Hydro sealant is a light-cured, fluoride-releasing sealant with thixotropic properties, which incorporates the benefits of both hydrophilic and hydrophobic sealants into one unique chemistry. Upon placement, its hydrophilic nature makes it more forgiving in moist environments. Yet, unlike competitor hydrophilic sealants, it is tough and durable because it is resistant to water absorption and degradation, similar to a hydrophobic sealant. Hence, this single-blind randomized clinical trial was conducted to compare and evaluate the retention, cariostatic effect, and discoloration of conventional Clinpro™ 3M™ ESPE™ and hydrophilic UltraSeal XT ® among 12 to 15-year-old schoolchildren. The present study is a single-blinded, randomized, split-mouth clinical trial conducted among schoolchildren aged 12–15 years of Mahatma Gandhi Higher Secondary School, Kuthambakkam, Chennai, Tamil Nadu, India. The sample size was calculated based on the study by Kumaran  using a priori type of power analysis by G* Power Software Version 3.0.1.0 (Franz Faul, Universitat Kiel, Germany). The minimum sample size of each group was calculated, following these input conditions: power of 0.90 and P ≤ 0.05 and sample size arrived were 60 teeth per group and 30 participants. Prior to the start of the study, ethical clearance was obtained from the Institutional Ethics Committee (STP/SDMDS13PHD43). Since the study was conducted in an orphan school, parental verbal consent was obtained over the phone and a school teacher was present on the telephone to witness the consent conversation and subsequently sign the applicable document. A written informed consent was obtained from the headmasters of the school as well as assent was obtained from the voluntary participants who were willing to participate in the study. Children in the age group of 12–15 years who were apparently healthy without any known history of systemic illness and those children with no or one carious tooth (decayed, missing, and filled teeth <2) were included in the study. Fully erupted maxillary and mandibular permanent first or second molar having intact contralateral first molar were selected for the sealant placement. Children with stain on grooves, suspected caries, enamel hypoplasia, or dental fluorosis and children who were uncooperative or refused dental treatment were excluded from the study. 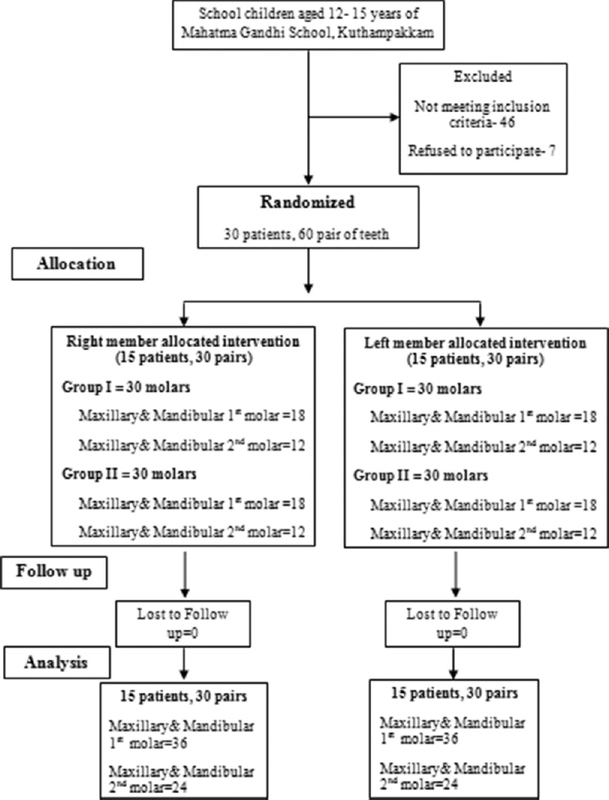 Simple randomization of treatment allocation was carried out using computer-generated random number for treatment assignment of right molar tooth. The left molar received the alternate treatment. The random number sequence was generated by a third person who was not related to the study. The random number generated was only disclosed to the treating clinician before sealant placement procedure. The assessor was blinded to the sequencing of the block and allocation of the groups. 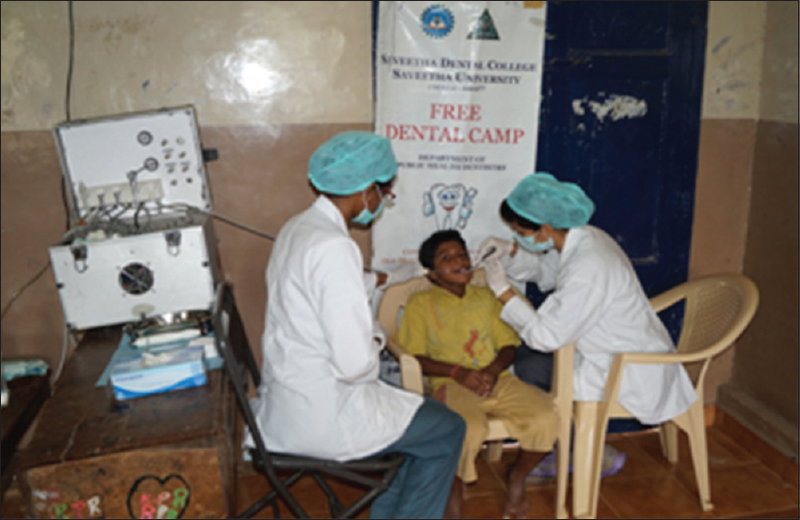 Examiners were calibrated through a series of clinical training in the Department of Public Health Dentistry, Saveetha Dental College, Chennai, prior to study and were assisted by a recorder. Interexaminer reliability was calculated by examining a group of 25 schoolchildren and the re-examination was carried out at least 30 min after the initial examination. The kappa value was 0.78, which denoted substantial level of agreement between the examiners. The interexaminer agreement for the two independent assessors was assessed on 10% (10 teeth) of sample. The kappa coefficient of 0.75 was obtained. Sealants were provided in the school by two operators with help from chairside assistants. Both the operators received training for clinical procedures for sealant placement with both the materials to reduce variation in treatment protocol. Random numbers determined the material used to seal the teeth. Bacterial plaques and debris were removed from all surfaces and grooves of the molars using a pumice slurry. Products tested in the present study and its composition are shown in [Table 1] and [Figure 1]. Occlusal surfaces of molars in both the groups were etched with 37% phosphoric acid for 15–20 s, washed with water which was removed by suction connected to a portable dental unit, and then dried with air blow from a 3-in-1 syringe attached to the dental unit. Resin sealant was then applied and light cured for 20 s using a light-emitting diode curing light [Figure 2]. Complete setting and retention of sealants and occlusion were checked before the children left. All the cases were clinically evaluated after 3 months of application. The primary outcome was sealant retention and the secondary outcomes were discoloration and cariostatic effect. The retention rate was assessed based on Color, Coverage and Caries (CCC) sealant evaluation system described by Deery et al. 2 – Demonstrable loss of tooth structure. Discoloration was quantified based on the presence or absence of discoloration of sealant and caries presence was scored without radiographs based on the WHO dental caries criteria. Diagnosis was primarily visual; probing was used only to confirm diagnosis. Data were entered in Microsoft Excel spread sheet and analyzed using SPSS software (version 20), (Armonk, NY: IBM Corp). Numerical data were presented as mean and standard deviation values. For test, P < 0.05 was considered statistically significant. 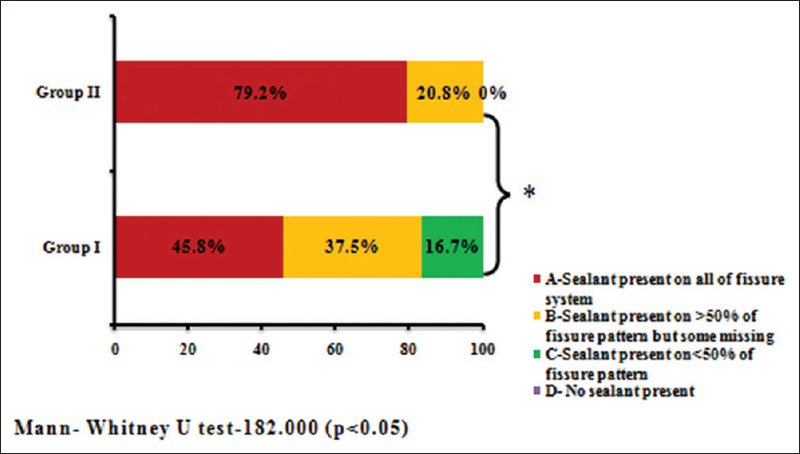 Retention (sealant coverage) was compared by the Mann-Whitney U test and Z-test for proportions between the two sealants. [Figure 3] shows the participant flow diagram for each group, in which children were randomly assigned, received the intervention, and analyzed for outcome. Thirty participants were recruited into the study and analyzed for outcome. Nearly 77.8% of Group II teeth showed sealant present on all of fissure system compared to Group I which was found to be 47.2%. On the other hand, 41.6% of Group I showed sealant present on >50% of fissure pattern but some missing, whereas only 22.2% of Group II showed a code of B. 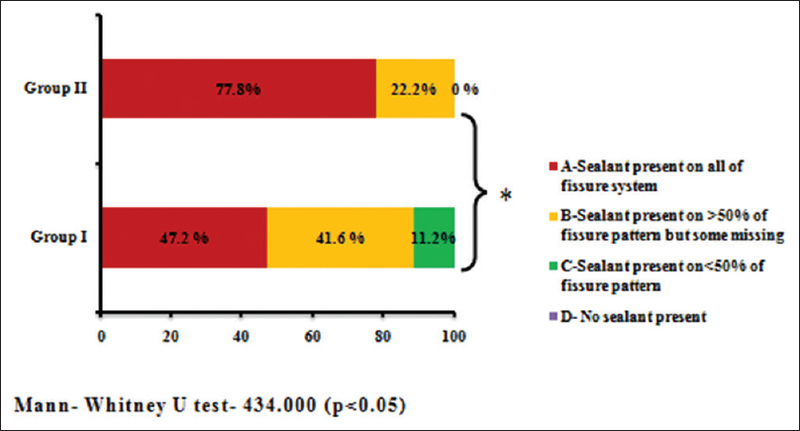 Almost 11.2% of Group I showed sealant present on <50% of fissure pattern, whereas Group II showed 0%. None of the groups showed a code of D which indicates no sealant present. Sealant coverage (retention) of Group II was found to be significantly higher compared to Group I sealant in maxillary and mandibular first molar after 3 months of sealant placement [Figure 4] using Mann–Whitney U-test (P < 0.05). [Figure 5] depicts the comparison of sealant coverage (retention) of Group I and Group II sealants in maxillary and mandibular second molar after 3 months of sealant placement. Nearly 79.2% of Group II teeth showed sealant present on all of fissure system compared to Group I which was found to be 45.8%. On the other hand, 37.5% of Group I showed sealant present on >50% of fissure pattern but some missing, whereas only 20.8% of Group II showed a code of B. Almost 16.7% of Group I showed sealant present on <50% of fissure pattern, whereas Group II showed 0% and was found to be significant statistically (P < 0.05) using Mann–Whitney U-test [Figure 5]. [Table 2] summarizes the comparison of sealant coverage (retention) of Group I and Group II using Z-test for proportion. A significant difference was observed for Codes A and C of sealant coverage. [Table 3] shows the caries incidence and discoloration of sealants. All the sixty teeth both in Groups I and II showed caries incidence score of 0. There was no discoloration of sealants in both the groups. Pit and fissures are approximately eight times vulnerable than the smooth surface caries lesion. The high incidence of pit and fissure caries is mainly due to its complex morphology which makes it an ideal site for retention of bacteria and food remnants. Another factor responsible for the high incidence of occlusal caries is the lack of salivary access to the fissures as a result of surface tension, effectively preventing remineralization and reducing the effectiveness of fluoride. The National Institute for Dental Research  showed that 54% of caries in the permanent dentition occurred on the occlusal surfaces and 29% occurred on the buccolingual surfaces. The National Preventive Dentistry Demonstration Program  showed that 54% of permanent tooth caries occurred on the occlusal surfaces and 35% occurred on the buccolingual surfaces. Based on these data, it can be reported that 83%–89% caries in the permanent dentition of children aged 5–17 years occurs in tooth surfaces with pit and fissures. Hence, the present clinical trial was conducted among schoolchildren aged 12–15 years with deep occlusal pit and fissures. Sealing the pit and fissures with sealants is mainly considered to be highly effective in the prevention of pit-and-fissure caries. The sealants which are commercially available are hydrophobic resin-based sealants, which are very technique sensitive and are influenced by several factors, such as patient co-operation, operator variability, and contamination of the operating field., A major drawback of sealing fissures is that the clinical procedure is extremely sensitive to moisture, which makes it difficult to etch partially erupted molars. In recent years, resin-based sealant technology has been developed that incorporates moisture-tolerant resin chemistry and behaves favorably in the moist oral environment. One such pit-and-fissure sealant with moisture-tolerant resin property is UltraSeal XT ® Hydro sealant which incorporates the benefits of both hydrophilic and hydrophobic sealants into one unique chemistry. Upon placement, its hydrophilic nature makes it more forgiving in moist environments. Yet, unlike competitor hydrophilic sealants, it is tough and durable because it is resistant to water absorption and degradation, similar to a hydrophobic sealant. It is a 53% highly filled resin with thixotropic properties (ideal viscosity) and its advanced adhesive technology allows it to flow into the pit and fissures and bond effectively without a drying agent to the tooth. Therefore, the higher bond strength results in reduced microleakage and increased marginal retention. Therefore, this present clinical trial was taken up to compare the efficacy of conventional Clinpro™ 3M™ ESPE™ and Hydrophilic UltraSeal XT ® Hydro sealants. The primary measure of sealant efficacy is retention. The clinical efficacy of fissure sealants is directly related to their retention.,,, If the sealant material stays bonded to the tooth and provides a good seal, then it is reasonable to expect that caries incidence can be decreased. The outcome measures assessed in the present study are retention, caries incidence, and discoloration. There is no standardized method for assessing and reporting the adequacy of sealed surfaces and this makes it difficult for comparative analysis and evaluation at recall visits. Most studies ,,, have formulated their own criteria or have utilized Simonsen criteria for evaluation of sealants. The limitation of Simonsen criteria is that it does not describe partial loss of sealant and does not include scoring of dental caries. The key aspects of a sealed surface that requires evaluation are identification of sealant, differentiation between preventive sealants and restorative sealants, sealant color, sealant coverage, and caries status of the surface. The CCC sealant evaluation criterion given by Deery et al. in 2001 is simple to follow, records dental caries, and also indicates the level of surface coverage. It encompasses scoring criteria for sealant retention on the surface of the teeth and for the evaluation of dental caries. The examination method for caries was visual-tactile, with emphasis on visual, and a blunt probe was used to confirm presence of the sealant. This explains the use of CCC sealant evaluation criteria in the present study. Most of the studies on sealants have used the half-mouth designs in which teeth on one side of the mouth were treated and teeth on the other side were left untreated.,, However, due to ethical reasons, untreated teeth cannot be used as controls. A split-mouth design is preferable for comparison of two sealant materials and it was ensured that every child receives Group I and Group II sealants on both sides of maxillary and mandibular permanent molars. According to evidence-based recommendation for pit-and-fissure sealants, retention of light-cured fissure sealants has been identified as a potential research area for generation of more evidence. There are no published clinical trials on comparing the efficacy of conventional Clinpro™ 3M™ ESPE™ and Hydrophilic UltraSeal XT ® Hydro. This necessitates the rationale for the present study. In the current study, 47 teeth (78.3%) with UltraSeal XT ® Hydro had the sealant covering all the fissures compared to Clinpro™ 3M™ ESPE™ which was 46.7% and the difference was observed to be statistically significant. 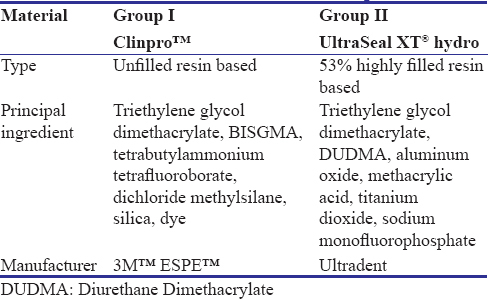 Group II (UltraSeal XT ® Hydro) showed similar observations when compared to a systematic review  done on retention of light-cured resin-based sealants which reported complete retention of resin-based sealants to be between 57% and 96% at 6 months after sealant placement. In a study conducted by Kumaran, Clinpro™ showed 75% total retention compared to Delton sealant (62.5%) at 6-month follow-up. A higher retention rate of 83% for Clinpro™ sealant at 4-month follow-up was reported by Reddy et al. Difference in retention rate between the two sealant materials could be attributed to three main factors: first, the thixotropic nature of Group II (UltraSeal XT ® Hydro) which chases moisture deep into pit and fissures on a microscopic level. Second, the adhesive technology of Group II (UltraSeal XT ® Hydro) creates higher bond strength. Hence, higher bond strength results in reduced microleakage and increased retention. Third, the wet or moisture contaminations adversely affected the marginal sealing when resin-based sealant (Clinpro™) was used. Most of the porosities normally present are plugged with moisture when the enamel is wet. This causes the lack of resin penetration, which results in tags of insufficient number and length to give adequate retention of the resin to enamel and subsequently, had a high level of microleakage. There was no difference observed in caries incidence between the two sealants. This could be attributed to the fluoride-releasing property of both the materials. To assess the significant difference in caries incidence and discoloration, a longer follow-up period is must required. Hence, this could be considered as one of the limitations of the current study. Therefore, the null hypothesis of the present study is rejected which indicates that there is significant difference in retention of Group I and Group II sealants. Based on the findings of the present study, it can be concluded that hydrophilic UltraSeal XT ® Hydro yielded better sealant coverage (retention) compared to the conventional Clinpro™ 3M™ ESPE™. No difference was observed with regard to cariostatic effect and discoloration. The newly developed moisture-tolerant hydrophilic sealant UltraSeal XT ® hydro can seal the newly erupted teeth that were previously left unprotected due to moisture control problems. Young DA, Nový BB, Zeller GG, Hale R, Hart TC, Truelove EL, et al. The American dental association caries classification system for clinical practice: A report of the American Dental Association Council on Scientific Affairs. J Am Dent Assoc 2015;146:79-86. Morales E, Martínez A, Hernández J, Alvarado K, Pozos A. Evaluation of marginal seal and microleakage of a sealant modified with silver nanoparticles in primary molars:In vitro study. ODOVTOS Int J Dent Sci 2014;16:107-13. Ripa LW, Leske GS, Sposato A. The surface-specific caries pattern of participants in a school-based fluoride mouthrinsing program with implications for the use of sealants. J Public Health Dent 1985;45:90-4. Wright JT, Crall JJ, Fontana M, Gillette EJ, Nový BB, Dhar V, et al. Evidence-based clinical practice guideline for the use of pit-and-fissure sealants: A report of the American Dental Association and the American Academy of Pediatric Dentistry. J Am Dent Assoc 2016;147:672-82. Simonsen RJ. Pit and fissure sealants. In: Clinical Applications of the Acid Etch Technique. 1st ed. Chicago, IL: Quintessence Publishing Co., Inc.; 1978. p. 19-42. Product Guide for Ultraseal XT Hydro. Ultradent Products, Inc.; 2013. Kumaran P. Clinical evaluation of the retention of different pit and fissure sealants: A 1-year study. Int J Clin Pediatr Dent 2013;6:183-7. Joseph O Donnell P.In vivo Evaluation of Embrace TM Wetbond TM Pit and Fissure Sealant; Internal Report; 2003. Available from: http://www.linkedin.com/pub/joseph-o-donnell/18/7A6/449. [Last retrieved on 2018 Jul 30]. Richard Mathewson J, Robert Primosch E. Fundamentals of Pediatric Dentistry. 3rd ed. Chicago, U.S: Quintessence Publishing Co.; 2008. p. 119-20. Tandon S. Textbook of Pedodontics. 2nd ed. Hyderabad, India: Paras Medical Publishers; 2008. p. 257-8. National Caries Program, NIDR. The Prevalence of Dental Caries in United States Children, 1979-1980. The National Dental Caries Prevalence Survey. US Department of Human and Health services, NIH 82-2245; 1981. Bell RM. Results of Baseline Dental Exams in the National Preventive Dentistry Demonstration Program, R-2862-RWJ. Santa Monica, CA: Rand Corporation; 1982. Weintraub JA. Pit and fissure sealants in high-caries-risk individuals. J Dent Educ 2001;65:1084-90. Aranda W, Courson F, Degrange M.In vitro evaluation of Embrace TM Wetbond TM pit and fissure sealant. Eur Cells Mater 2005;9:73-4. Mascarenhas AK, Nazar H, Al-Mutawaa S, Soparkar P. Effectiveness of primer and bond in sealant retention and caries prevention. Pediatr Dent 2008;30:25-8. Strassler HE, Grebosky M, Porter J. Success with pit and fissure sealants. Dent Today 2005;24:124-40. Simonsen RJ. Retention and effectiveness of dental sealant after 15 years. J Am Dent Assoc 1991;122:34-42. Howard Strassler E, Joseph O'Donnell P. A unique moisture-tolerant, resin-based pit-and-fissure sealant: Clinical technique and research results. Inside Dent 2008;4:108-10. Subramaniam P, Jayasurya S, Girish Babu KL. Evaluation of glass carbomer sealant and a moisture tolerant resin sealant-A comparative study. Int J Dent Sci Res 2015;3:1-8. Parnell CA, O'Farrell M, Howell F, Hegarty M. Evaluation of a community fissure sealant programme in county Meath, Ireland. Community Dent Health 2003;20:146-52. Karaman E, Yazici AR, Tuncer D, Firat E, Unluer S, Baseren M, et al. 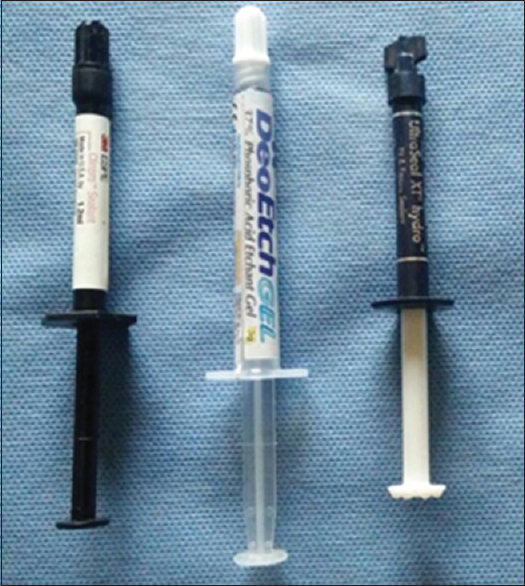 A 48-month clinical evaluation of fissure sealants placed with different adhesive systems. Oper Dent 2013;38:369-75. Ninawe N, Ullal NA, Khandelwal V. A 1-year clinical evaluation of fissure sealants on permanent first molars. Contemp Clin Dent 2012;3:54-9. Raadal M, Laegreid O, Laegreid KV, Hveem H, Korsgaard EK, Wangen K, et al. Fissure sealing of permanent first molars in children receiving a high standard of prophylactic care. Community Dent Oral Epidemiol 1984;12:65-8. Jodkowska E. Efficacy of pit and fissure sealing: Long-term clinical observations. Quintessence Int 2008;39:593-602. Mertz-Fairhurst EJ, Schuster GS, Fairhurst CW. Arresting caries by sealants: Results of a clinical study. J Am Dent Assoc 1986;112:194-7. Muller-Bolla M, Lupi-Pégurier L, Tardieu C, Velly AM, Antomarchi C. Retention of resin-based pit and fissure sealants: A systematic review. Community Dent Oral Epidemiol 2006;34:321-36. Reddy VR, Chowdhary N, Mukunda KS, Kiran NK, Kavyarani BS, Pradeep MC, et al. Retention of resin-based filled and unfilled pit and fissure sealants: A comparative clinical study. Contemp Clin Dent 2015;6:S18-23. Hormati AA, Fuller JL, Denehy GE. Effects of contamination and mechanical disturbance on the quality of acid-etched enamel. J Am Dent Assoc 1980;100:34-8.